Focusing on Polish and European population genetics and modern physical anthropology. The figure below is from the recent Mathieson et al. 2017 preprint; slightly edited to highlight the results of nine Globular Amphora Culture (GAC) samples from two burial sites in what are now Poland and Ukraine. Despite living in East Central Europe at about the same time as the nearby Yamnaya people of the Pontic-Caspian Steppe, these GAC individuals show practically zero Yamnaya-related or steppe ancestry (note the almost total absence of the orange "Yamnaya" component in the Globular_Amphora results in the ADMIXTURE bar graph). Instead, they're very similar to Chalcolithic and Middle Neolithic Central and Western Europeans, with whom they overlap in the Principal Component Analysis (PCA). During the tail end of the GAC period, East Central Europe was suddenly dominated by a new archaeological complex called the Corded Ware Culture (CWC). Although most CWC individuals sampled to date show minor GAC-related ancestry, they're overwhelmingly Yamnaya-like, which suggests that by and large the CWC population has its origins on the Pontic-Caspian Steppe. In fact, some of the earliest CWC examples from the Baltic States, such as Latvia_LN in the ADMIXTURE bar graph, are basically identical to Yamnaya people. It was suggested not long ago that the presence of Yamnaya-related ancestry in modern-day Europeans could be mostly explained by the so called Isolation-by-Distance phenomenon (see here). But as I said at the time, this was a major faux pas, and thanks to these GAC samples I now have direct evidence from ancient DNA to back me up. So forget the idea of anything resembling a gentle cline in Yamnaya-like ancestry east to west across Europe before proto-CWC and Yamnaya exploded from the steppes. By the way, in that critique I said that it's not possible to recapitulate ancient populations with ADMIXTURE components. I stand by that statement, although as we can see in Mathieson et al. 2017, it is possible to get close at times with enough of the right ancient samples; close enough to make some general observations anyway. 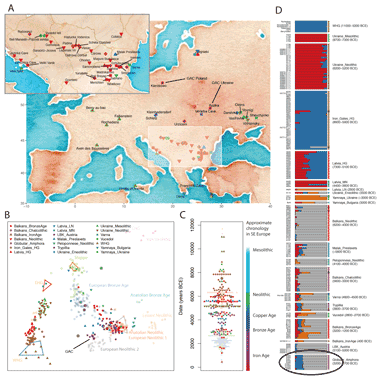 Interestingly, on the PCA plot, the European Bronze Age cluster is more or less half way between GAC and Latvia_LN. This is also where modern-day Poles and Ukrainians cluster on such plots when they're not significantly skewed by projection bias or shrinkage. Thus, I do wonder if the Slavs of East Central Europe are essentially a 50/50 mixture of early CWC and late GAC? I'll try and test this when the Mathieson et al. 2017 dataset goes online. The conundrum in my mind is whether there is one steppe populations that is a common origin in the EBA for both CWC and BBC. The alternative is that CWC is a northern European steppe population and BBC steppe ancestry is from a southern European steppe populations, with the R1a = CWC, R1b = BBC divide reflecting a genuine cultural/ethnic/linguistic divide between the source population for CWW and the source population for BBC. Now, obviously, even in that scenario, there has to be a common European steppe autosomal DNA/R1 population that splits into a pre-CWW and a pre-BBC component, and that date can't be too terribly remote in time - certainly no older than Mesolithic and probably Holocene. But, my intuition on the time depth of TMRCA for both CWC and BBC isn't very refined. It certainly has to be earlier than 2400 BCE (about 4400 BP), and the split can probably be documented even a few centuries before that. IIRC, there is not GAC in any of the BBC individuals, even though as the original post notes, there is GAC at low levels in lots of CWC ancient DNA. I seem to recall the data showing some commonality but preliminary Y-DNA distinctions in EHG individuals, which would get you back to something earlier 5000 BCE/7000 BP. But, it has to be after MA-1. Could a pre-CWC/pre-BBC split date to the 8,2 kiloyear climate event? The timing is about right. This could also plausible be the event that is the push factor that sends R1b-V88 folks to Africa whose descendants become the linguistically Chadic people and the bleed into neighboring populations from a population genetic perspective. Maybe, it was really a three way split with a previously single population fracturing into African, southern European steppe and northern European steppe populations as a result of the climate event. After R1a1a, I2 is the quintessential Polish y DNA haplotype.